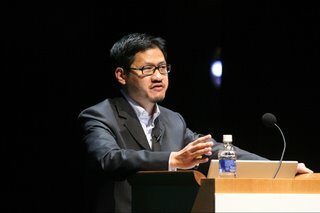 Ben Tsiang co-founded SINANET.com, the largest Chinese website in North America and the precursor of SINA.com. He has served as Vice President of Global Products, in charge of product integration and strategic planning with SINA's localized web sites worldwide; General Manager of SINA Taiwan; GM of SINA East China; and GM of SINA Mobile. Mr. Tsiang was appointed to his current role of Executive Vice President of Product Development and GM of SINA Online in November 2003. He graduated from National Taiwan University and received a master's degree from Stanford University. Ben spoke of the Chinese market for design. He made a very interesting observation that one of the big challenges now in China is not rapid growth, but rational growth. Social change is a big characteristic of the Internet there, since it is collapsing the gaps between Chinese regions and their distinctive and different cultures. One of the interesting phenomenon is the “panda” culture—the fact that, since national policy limits families to one child, those children are considered very “precious” and are given everything.